I had been to Kuching several times in the past and had always had a yearning to experience once again its heady multicultural mix of history, culture and all things Sarawakian. It was with much eagerness that I returned as part of Batik&Bubbles, to attend the inaugural Rainforest Fringe Festival in July this year! I was curious to see if Kuching had been gently nudged into gentrification; for instance when you walk into a random city and see the same food and beverage outlets or shops which make it unidentifiable from any other city. I was glad to see that Kuching was still as charming as ever and thanks to the organisers of Rainforest Fringe Festival 2017, Joe Sidek and co, who had concocted a wonderful 10 day festival for culture vultures, we got to revel in what is arguably one of Malaysia's most culturally strong cities. Batik&Bubbles were selected to be part of the Kuching express and joined a creative entourage of writers, actors, playwrights, bloggers and personalities from Malaysia and Singapore. We were one of the chosen few to be invited to enjoy a taste of Kuching's very first fringe festival. The festival had so many different aspects to it covering handicrafts, fashion, art exhibitions and photography and more that we decided to share our stories in two pieces. So do make sure you catch the first post here! With some of the KL 50 creative influencers and Kuching personalities at the Theatre of Clothes fashion gala event! My colourful handbag is by Souk Stroll! For weeks we had been anticipating the much lauded Theatre of Clothes event. There was an unmistakable electrifying buzz in the air during the cocktail hour proceeding the fashion gala. In attendance was the gracious Chief Minister of Sarawak's wife, Datin Amar Datuk Juma’ani Tun Tuanku Bujang along with many of Kuching's socialites and noted personalities. We were presented with a fashion extravaganza featuring mainly Sarawakian designers such as Dato' Tom Abang Saufi, Neng Kho Razali, Ramsay Ong, Edric Ong, Tanoti crafts and a special collaboration between Singaporean designer Ong Shunmugam and the Tun Jugah Foundation. I can fully understand why they decided to name the evening the "Theatre of Clothes" as we got to spectate so much more than a fashion show. We experienced plenty of drama and flair with the models showcasing so many examples of ornate Sarawakian design, jewellery and craft. It felt more like an ensemble cast of actors creating a spectacular performance with each collection, interpreting different acts in a play and creating so many new stories! The mix of contemporary and modern designs infused with the traditional materials and craftsmanship were abundantly eye-catching, and one couldn't help getting excited as piece after piece sashayed down the runway! We noted that the music had been cleverly curated to accompany the various different types of designs; whether it was Sarawakian traditional music or eclectic modern tunes, they all added an additional layer of ambience and excitement to the shows! It was also a lovely surprise when 3 elderly ladies from an indigenous Sarawakian hill tribe, danced down the runway performing their traditional dance. Apparently there are only a handful of people left in Sarawak who still wear the traditional rings around their arms and legs. We were indeed so fortunate to be able to watch their performance and who knows when, or if ever they will perform in public again! The most breathtaking highlight of the show was when a group of ladies and gentleman of mainly Iban heritage, proudly donned their traditional hand-tapped tattoos and strutted down the runway. They didn't need to showcase any clothes, instead they showed off their distinctive tattoos, each tattoo telling a unique story. There was a collective gasp and then applause, as the men and women confidently strode down the catwalk, their skin gleaming like canvas and their tattoos more akin to beautiful paintings! As the night drew to a close, the fashion gala undoubtedly surpassed our expectations in its celebration of fashion and culture! With fellow KL50 express concert goers, Sasibai Kimis from Earth Heir and Deborah Henry! 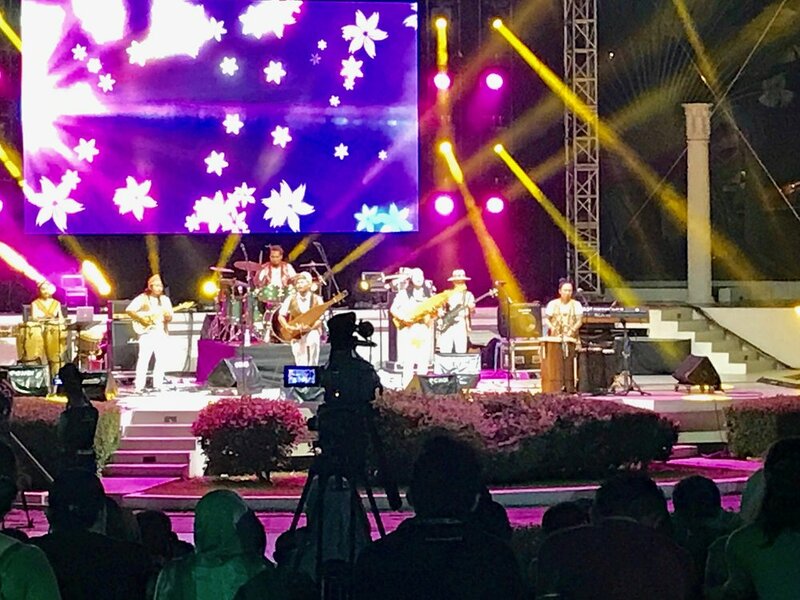 The following evening, the Kuching Express collective hopped on buses to the open-aired amphitheatre Panggung Udara Kuching, where along with other Kuching-ites and tourists, we were treated to a free concert by Sarawakian performers. Tony Eusoff, the MC for the evening, regaled the audience with personal stories before breaking into a rendition of "Better Man" in a Sarawakian dialect! He was then followed by various Sarawakian natives such as solo-artists Noh Salleh and Pete Kallang, songstress Dayang Nurfaizah, group ensembles At Adau and Nading Rhapsody and also Mathew Ngau and Alena Murang who played so eloquently on their sapes. It was such an elaborate showcase of Sarawakian music and it was great to see both locals and tourists either sing along or shimmy to the music late into the night! On our final day in Kuching, we took the opportunity to visit some of the exhibits of the Rainforest Fringe Festival which were located in the Round Tower, just in front of our hotel. It was here that we first discovered the works of Kendy Mitot, a Sarawakian artist from the Bidayuh tribe who is based in Kuala Lumpur. His sculptures focus on the indigenous people of Sarawak with regards to their rituals, traditions and ceremonies. One can see how much thought and personal expression had been put into making these sculptures. This mixed media installation named "The Last Voyage of the Souls" was composed of boats made from sago fronds. These sculptures denote the souls of the dead that"sail" above sacks filled with grain. Another unique piece by Kendy was "The Guardian Spirits", a collection of wood-carved totems called tipaduak which are often placed infront of a Bidayuh longhouse for protection. (Apparently many of the Bidayuh clan have converted to Christianity and therefore only less than 10% of Bidayuh still practise this ritual today). It was indeed very interesting to see that Kendy's approach to preserving his heritage,is done through his art work and we cannot wait to see more of his artwork, maybe next time in KL! We also managed to view some of Alena Murang's art work at the Round Tower. Alena is very well known for her music as a sape musician and singer but she also has a talent for art! Her acrylic and charcoal drawing at the exhibition, "The Storyteller", was accompanied by an audio recording of the Kelabit elders teaching their songs to Alena. The Kelabit are another indigenous people belonging to the Dayak tribe in Borneo and it has been a tradition for Kelabits to teach their way of life through song. Unfortunately, this tradition is not being practised as much, as the songs have either been forgotten or lost so kudos to Alena Murang for giving us a glimpse into this almost forgotten ritual. When Batik&Bubbles were first invited to the Rainforest Fringe Festival by Joe Sidek, and Shireen Zainudin, we knew it was going to be something great . However, we were totally blown away with the level of mastery that was showcased. Although we spent 5 days here in Kuching, we could easily have spent another 5 weeks more as Kuching, not to mention all of Sarawak in terms of arts and culture. Although my family was unable to join me this time, I can't wait to explore Sarawak together with them in the future. Kuching, we will be back and see you at the Rainforest Fringe Festival 2018 ;) ! We would like to extend our heartfelt thanks to Joe Sidek and Shireen Zainudin for inviting Batik&Bubbles to the first ever Rainforest Fringe Festival! Huge congrats on such an amazing and enjoyable festival; a great eye-opener and introduction to the wonders of Kuching and all things Sarawak!! I am on always on the look out for beautiful and interesting handicrafts and souvenirs to collect or bring as gifts when visiting family and friends overseas. Apart from places on the beaten path like Central Market or Petaling Street, it makes a refreshing change to find new venues where one can find such intriguing items. When I heard about the Hari Kraf Kebangsaan 2016 , an annual festival happening at Kompleks Kraf in Jalan Conlay, I leapt at the chance to visit, as it is a rare opportunity to view some of Malaysia's best handicrafts under one roof.